Easy to cook, versatile, and flavorful, quinoa is gaining well-deserved popularity. 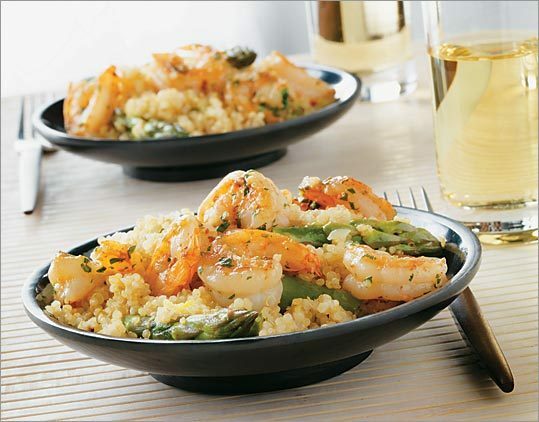 (Photograph by Jim Scherer, styling by Catherine Kelty) Tangy, lemony quinoa, crisp asparagus, and tender shrimp make fine partners for dinner. Quinoa is ancient in origin, but very modern in appeal. Pronounced KEEN-wah, this grain (you eat the seed) dates back thousands of years to early civilizations in South America, yet its 21st-century virtues are hard not to love. The texture is light and fluffy, not sticky or starchy. It cooks quickly, contains no gluten, and has plenty of protein. In fact, many nutritionists refer to quinoa as a "superfood." Quinoa tastes mild and sweet, with nutty notes and a faintly tangy finish. Before cooking, always rinse quinoa well under running water to wash away the saponin, a natural - and easily removed - coating with a bitter flavor. Include the jalapeno seeds and membrane for a spicier dish. In a large pot, bring 4 quarts of water to a boil. Add 1 tablespoon of salt and the corn, and cook until kernels are heated through and tender, 3 to 4 minutes. Remove the corn and cool, then cut off kernels and place them in a large bowl (you should have 3 to 4 cups). Return the water to a boil, add the quinoa, and cook until almost tender, about 10 minutes, then drain the quinoa in a strainer. Add about 2 inches of water to the pot, reduce heat to medium, and bring water to a simmer. Set the strainer with the quinoa over (not touching) the water, cover the quinoa with a clean, folded kitchen towel, place the pot lid over the strainer, and steam until the quinoa is tender and dry, about 10 minutes. Cool the quinoa briefly and add it to the corn, then fluff and mix with a fork. Meanwhile, in a medium bowl, mix lime zest and juice, honey, jalapeno, and 1/4 cup mint. Vigorously whisk in the olive oil, and season with salt and pepper. Pour the dressing over the quinoa mixture, add 2 teaspoons of salt, red onion, black beans, and the remaining mint, mix, and serve. Adjust the oven rack to the center position, place an ovenproof serving dish on rack, and heat the oven to 200 degrees. In a large nonstick saute pan set over medium heat, heat 2 tablespoons of oil and 1 tablespoon of butter. Add the onion and cook until soft, about 5 minutes. Add the quinoa and cook, stirring constantly, until quinoa smells toasty, about 4 minutes. Add 2 3/4 cups of water and 1 teaspoon of salt, increase the heat to high, and bring to a boil. Reduce the heat to low, cover, and simmer until the quinoa is just tender, about 12 minutes. Off heat, sprinkle the asparagus over the quinoa, replace the cover, and set pan aside until quinoa has absorbed all of the liquid and the asparagus is tendercrisp, about 12 minutes. Add the lemon zest and juice, season with black pepper and additional salt, if desired, and stir. Transfer the quinoa to the warmed serving dish, spread it out to make a bed, and place in the oven to keep warm. Wipe out the saute pan with a paper towel, add 1 tablespoon of oil, and set over high heat. When the oil just begins to smoke, add half of the shrimp and cook, without moving, until they begin to turn opaque, about 1 minute. Quickly turn the shrimp and cook until fully opaque, about 45 seconds longer, and transfer to a bowl. Add the remaining 1 tablespoon of oil to the pan, and repeat the process to cook the remaining shrimp. Add the remaining 2 tablespoons of butter to the pan, place over medium-low heat, and when the butter has melted, add the garlic and cook, stirring constantly, until fragrant, about 45 seconds. Add the wine and a pinch of cayenne and stir to blend. Return the shrimp and any accumulated juices to the pan, add the parsley, season with salt to taste, and stir to combine. Remove the serving dish from the oven, pour the shrimp and its juices over the bed of quinoa, and serve at once. Vegetarians can use vegetable stock instead of chicken broth. In a large Dutch oven or soup kettle set over medium heat, heat the oil. Add the leeks, stir to coat, and cook, stirring often, until softened, about 8 minutes. Add the garlic, ginger, orange zest, coriander, and cumin, stir, and cook about 1 minute. Add the broth, increase heat to high, and bring to a boil. Add the quinoa and sweet potatoes, reduce heat to medium-low, and simmer until quinoa is cooked and potatoes are tender, 10 to 12 minutes. Add 2 teaspoons of salt and pepper to taste and stir to combine. Add the chard, and rest off heat until wilted, about 3 minutes. Season with more salt and pepper, if desired, and serve, garnishing with queso fresco.